There are a couple of interesting rumors floating around about this mine, one, like the rumour of the chicken in El Dorado suggests that a local cow was found to have a nugget in its belly when slaughtered. Another rumor was that the fatality that contributed to the mine’s closure was a collapse that killed several workers – other sources suggest that it was only 1 worker who had died. Apparently the body/bodies were never recovered. 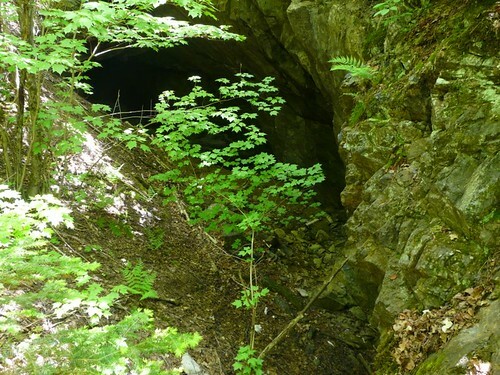 Anyway, this old gold mine is at the end of a short gulley up against a remote, though beautiful hill of granite. Nearby towns are all just barely functioning, most buildings boarded up and rotting. About the only thing that seems to have attracted outside attention lately (aside from my own) was the “hempfest” nearby – but none of that at the mine. Drenched in DEET, trying to read my GPS which refused to function beneath the trees, I approached the mine cautiously, watching for loose rock and the ever-present possibility of bears. (I realize that some suggest you wont find bears in mines, but that is no consolation if I round a corner and find myself face to face with the bear that isn’t there). I found no bears, but the horse flies chewed big scabs onto the top of my balding head. IMG_1620, originally uploaded by Mic2006. 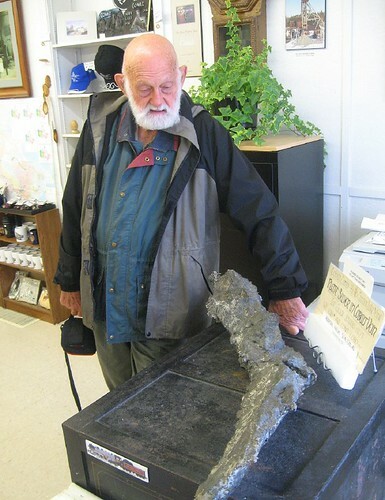 This is Ralph holding a slab of “tourmaline in quartz” at the Coe Hill gold mine. There is an intrusion or pocket at the top oif a hill on that property that consists almost exclusively of quartz impregnated tourmaline. 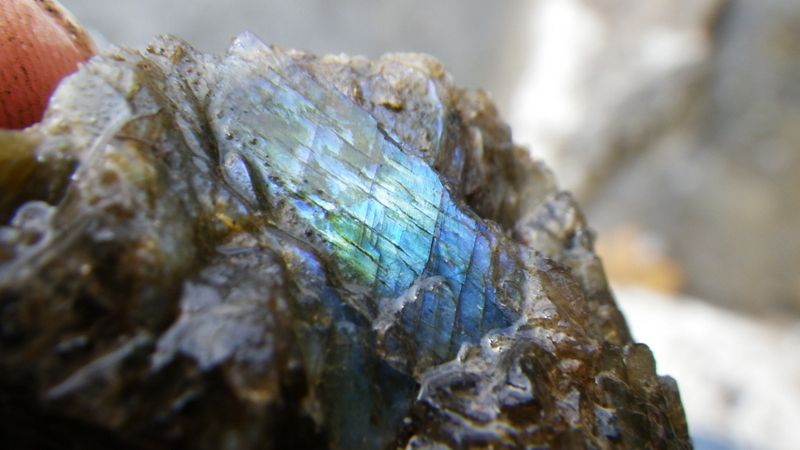 One interesting thing about tthe tourmaline is that the spines are all bent as though they were being washed around in water – like a current moving sea fans. I suspect it has something to do with the cooling process. You might notice the new header up at the top of the blog – that is courtesy of my “brother-in-law Nige”, he is a computer whiz and the guy who got me blogging in the first place. 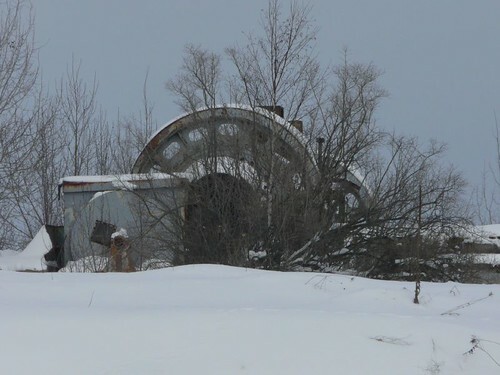 The picture has been derived from larger photo of the wheels of abandoned mine trolleys in Cobalt. I am off to Cobalt tomorrow so you can expect more pictures like that soon. Reason for visiting Cobalt – to get more high Resolution picturesd for my upcoming book “Rockhounding: An Experience of the North” I dont want to give to much away at this time, but as you might surmise it will be of interest to mineral collectors – and inadvertantly – cavers as well as there are a few sidebars about Ontario caves – yet to be published material. I have a publisher who has shown interest in the idea – with some modification from the original format. If you want to help me – link to my site – it will increase my ability to reach the world. Oh, and thanks Nige. You have some scotch coming your way. P1010856, originally uploaded by Mic2006. 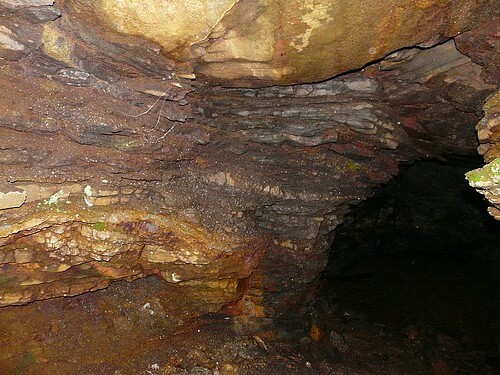 I had one heck of a time finding the Harcourt Graphite Mine, following directions from an old guide book only to discover that the directions were wrong. 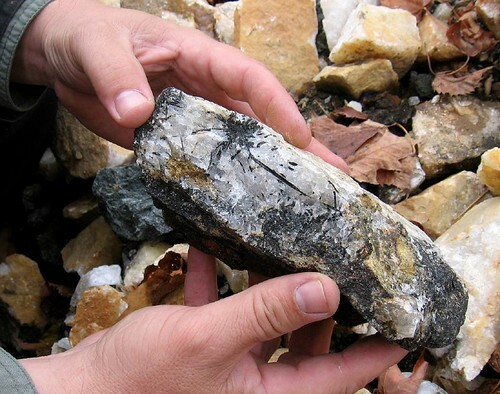 Simply put, the mine is only about 150 meters off highway 648 – just outside Harcourt. Being densely wooded, I wandered well past the old buildings and ended somewhere off in the middle of nowhere. Amongst other somewhat unfortunate events that day I stepped on a rusty nail in the remnants of the old mill. I actually found the diggings by limping through the bush, imagining from clues how they would have situated the mill in respect to where they would have been digging their ore. This is an example of the kind of mine that is better left un-explored. I went only as far as the adit entrance to get this picture. The roof looks like it needs scaling – just waiting for some errant explorer to bump a rock and down it all comes. 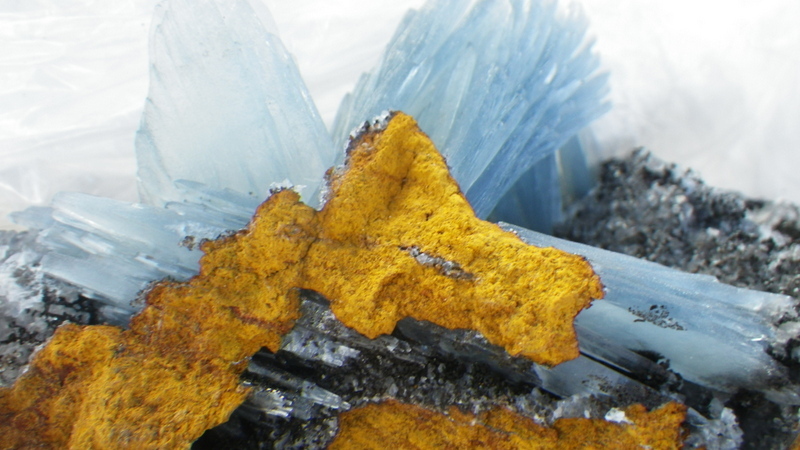 I would imagine that the graphite is in the lighter coloured rock as the guide book says that ” yellow jarosite and and rusty goethite” are powdered over the graphite.